Soprano Julianne Olson, a native of Bellingham, WA, has performed with Lyric Opera of Chicago in the world premiere of The Property, Hungarian National Theater of Szeged and Pac in The Crucible, Princeton Festival in Threepenny Opera and concertized with Asheville Lyric Opera, Seattle International Artists Series, Ravinia Festival tour throughout Europe and the west coast, the Puccini Gala at Rose Theater, Lincoln Center, Peoria Symphony as Fiordiligi in Così fan tutte, and throughout South Korea (Seoul, Busan and Jeju) and Indonesia (Surabaya and Jakarta). 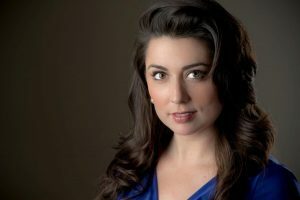 Julianne has twice been awarded from the Metropolitan Opera National Council and has performed such roles as Butterfly in Madame Butterfly, Mimi in La Boheme, Pamina in The Magic Flute, Antonia in Tales of Hoffman, and Tatiana in Eugene Onegin and earlier this month sang Musetta in La Boheme with Opera Roanoke. Julianne has been an invited performer to the United Nations in New York City and was the vocal soloist on tour through China with the Manhattan Symphony. Julianne has performed in over a dozen countries singing multiple genres from opera to pop and gospel to cabaret. In Greensboro, Julianne has sung the Beggar Woman in Sweeney Todd with NC Summer Rep at Triad Stage and is thrilled to perform a few of Bolcom’s Cabaret Songs with the UNCG Symphonic Band. As a teacher, Julianne was formerly the Coordinator of the Voice Department at Universitas Pelitas Harapan in Jakarta, Indonesia, has been an adjunct professor of voice at Radford University, a teaching artist with Chicago Opera Theater, Ancient Paths in Malawi, Africa, Midori and Friends in New York City, and additionally served as a Project Manager for Sing for Hope, New York City, singing and recruiting singers to provide music at hospitals throughout Manhattan and the five boroughs. Julianne holds music degrees from The Boston Conservatory (BM), New Jersey City University (MM), Indiana University (PD), and is a current Doctoral Candidate and Teaching Assistant at The University of North Carolina at Greensboro studying voice with Dr. Robert Bracey.